125th LIAISON SQUADRON - De website van vintageflightfoundation! it trained with various aircraft at Fort Sill and other installations. 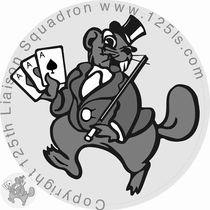 In April 1943 the 125th was renamed the 125th Liaison Squadron. 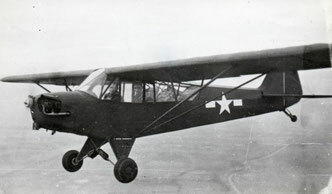 Transferred to Texas, it joined the Second Air Force Support Command and was re-equipped with L-5 Sentinel aircraft. In January 1944 the squadron became a part of the 76th Tactical Reconnaissance Group. arrived in France in August 1944 and served with the Twelfth and Sixth army groups. In November 1944 the 125th was assigned to the XIX Tactical Air Command (Provisional) and then to the IX Fighter Command. 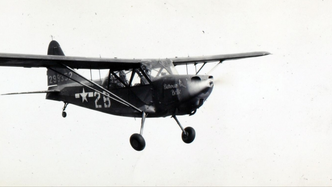 The 125th operated out of smaller airstrips such as Maastricht - Sint Pietersberg, Kornelimünster, Mönchengladbach and Bielefeld but also from larger airfields. After V-E Day the 125th was transferred to the XII Tactical Air Command of the Army of Occupation. As our foundation operates both the L-5 and L-4 and we are based in the former action area of the 9th Air Force, it was our choice to name our Squadron after the 125th LS and honour the men and women who served in this unit.